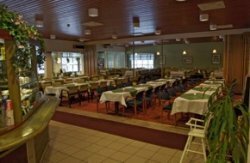 The heart of the Karjalan Kievari is our high-quality restaurant that follows the Karelian food traditions by offering a lot, but good. 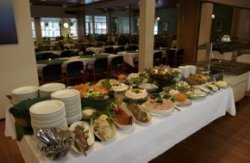 You can choose a quick buffet or our own kitchen´s delicious á la carte menu. Our tasty everyday breakfast gives you a good start for your active day. Our restaurant has 200 customer places and it is located in gorgeous surroundings. We offer great settings for big festivities and also for smaller occasions. In addition to the restaurant you can use our decked terrace with a panorama view and convenient conference room with right to dispense alcohol. We serve lunch at 11-16.